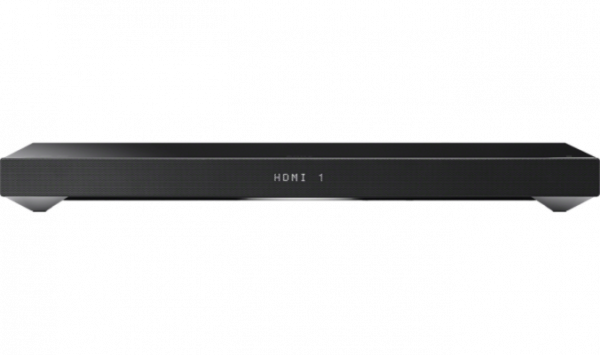 Product information "Sony HTXT1CEK TV Sound Base with Built-In Sub"
A complete home audio setup starts and ends with the HT-XT1. This slim all-in-one sound box packs a built-in subwoofer and 170W of room filling audio into a compact design that sits underneath your TV. Experience virtual 3D cinematic sound with S-Force PRO Front Surround technology, and stream music in an instant with NFC and Bluetooth. Want the immersive experience of cinematic sound but without the clutter of a multichannel audio system? The HT-XT1 has a flat box design with a scratch-proof glass top, for a premium finish. That means the box can sit to the side or act as a stand for your TV. Power up your sound experience with a 2.1 channel 170W total audio output and experience the action of your favourite movies in room-filling audio. The HT-XT1 also packs a built-in subwoofer into the compact box design to deliver deep, rumbling bass tones for an immersive sound experience Fill your living room with 3D cinematic sound. The unique S-Force PRO Front Surround technology bends sound around your entire room using just two front-facing speakers to deliver a virtual 5.1 channel surround sound experience. Want to listen to music in an instant? Simply touch an NFC enabled smartphone or tablet to make a connection with Wi-Fi, and hear your favourite tunes fill the room. Don't worry if your smartphone doesn't have Wi-Fi or NFC capabilities you can still stream music directly from your phone or tablet using a wireless Bluetooth connection. Effortlessly connect the HT-XT1 all-in-one sound box to your TV, Blu-ray player or PlayStation thanks to three HDMI inputs and one output for an easy setup. Related links to "Sony HTXT1CEK TV Sound Base with Built-In Sub"
Customer evaluation for "Sony HTXT1CEK TV Sound Base with Built-In Sub"